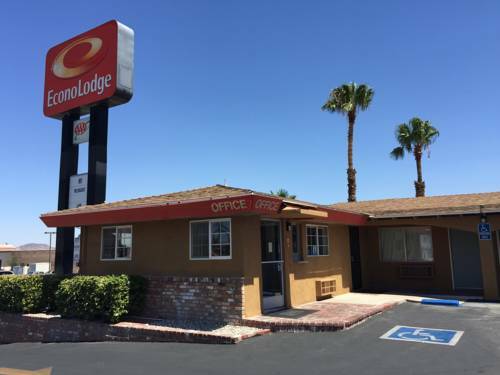 Located on historic Route 66 and close to Marine Corps Logistic Base, BNSF Railway, Union Pacific Railroad and Fort Irwin National Training Center. Free amenities include wireless internet, continental breakfast, daily paper, and picnic area. All rooms feature microwaves, refrigerators, local calls and cable TV. Other Mojave Desert attractions include Barstow and Tanger Outlets, Solar One, The Goldstone Observatory at NASAs Deep Space Communication Complex, Calico Ghost Town, and Edwards Air Force Base. LA/Ontario International Airport is 70 miles and Las Vegas is 155 miles away. Pet accommodation: 10.00 per night dogs only. Please advise at check-in. The pool is currently closed and is undergoing renovations through April 14th 2013. US Army camel driver and other unique exhibits at the 11th Armored Cavalry Regiment Museum, on remote Ft. Irwin. Built in 1990, the World's Tallest Thermometer's 134-foot height matches the highest recorded temperature of 134 degrees.